Everest carrier. Metal frame, leather straps , metal buckles. Canvas carrier. Open - 43(l) x 39.5(w) x 30 (d) cms. Strange as it may seem, an Everest Carrier does not appear to have a direct link with Mount Everest; at least we can't find one. 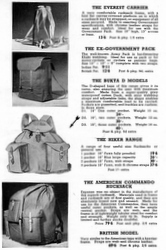 They first appeared during World War Two as an attachment to the BSA Folding Bike that was used by airborne troops. 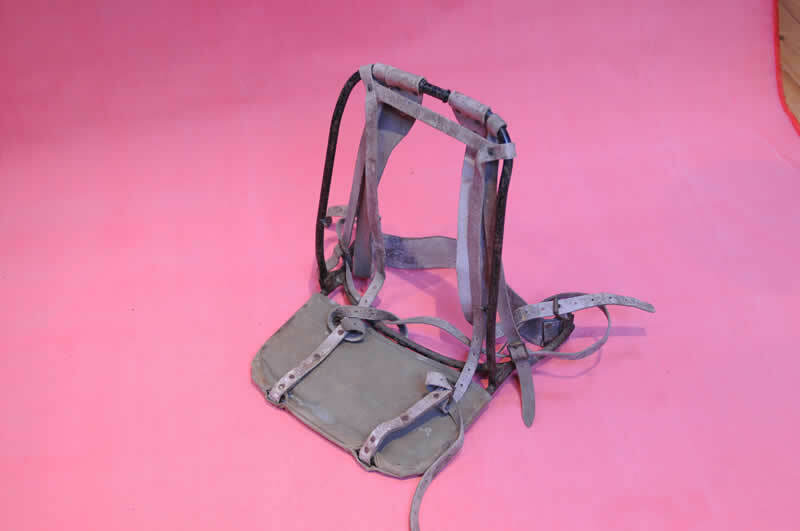 They were fitted to the front of the bike, as you can see from the picture opposite and could easily be removed for use as a rucksack/backpack - indeed there are several pictures of non-airborne troops using them in the many historical World War Two books. Whether or not the military took the design from pack frames used on Mt. Everest before the war or just dreamt the name up is unclear. We do know that some were taken on the successful Mount Everest expedition in 1953, which has led to many people to believe that is where they originated. A huge amount of surplus equipment was sold off by the Ministry of Defence (MOD) after the war, a lot of it becoming the standard 'outfit' for post war mountaineers and it's via this route that the carrier we have here in the collection came to Lochaber Mountain Rescue Team sometime in the 1960's. It was one of two which, amongst other things, were used to transport car batteries up to the C.I.C. Hut below the North Face of Ben Nevis to power the mountain rescue radio. 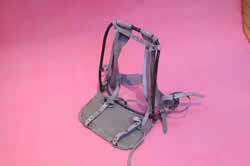 Windpower and modern rucksacks made these carriers redundant in the 1990's and Lochaber MRT kindly donated them to us.